Among radio amateurs the "Rothammel" for many years has been an indispensable, firmly established standard. When it was first published in the 50s the book originally was a handbook which then has evolved into an extensive and practice-orientated reference book for antennas. Until 1988/89 two separate editions for East- and West-Germany were published, varying also in contents. The author of the book, Karl Rothammel, DM2ABK (Y21BK was his last amateur call sign), died in 1987. In 1991 the first "all-German" edition was published. 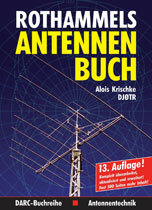 Alois Krischke, DJ0TR/OE8AK, a friend of Rothammel and an acknowledged expert on antennas, was responsible for the continuing and supplementary editions published in the years 1991, 1995 and 2001. The short periods between the up-dates should guarantee topicality by informing about the latest developments. The next edition of the antenna book, which is already out of print, will be published halfway through the year 2001. The comprehensible and didactically well presented book provides basic information about the construction and the usage of the various forms of antennas. For this edition the whole book has been fully revised, extended and up-dated and has 1500 pages now. There are now so many different antennas that it is barely possible to understand them all. A coherent reference source on antennas in the form of an encyclopaedia was not avalaible until now, but this book fills the gap. Some 1300 terms from the field of antenna engineering are explaned, and the text is illustrated by more than 480 drawings, diagrams and photos. The book descibes the principal characteristics of different types of antenna, relating to the very latest sources. The definitions are clear and the explanations are based on up-to-date knowledge and standards. The correct English equivalent is also given for almost every term. Expressions from antenna engineering that are no longer common are also included. References, inventors and patents are named so that the reader can research further. This is a book that can be recommended for everyone who works with antennas. Unfortunately the title is out-of-print and a new edition is not planed yet.